Google Contacts is one of the most popular ways to organize contact information for personal and professional networks. Yet, not everyone wants to access and edit their contacts through the web interface. For many people, Excel or other spreadsheet software is how they interact with large amounts of data. Especially for business information workers, Excel is the way they experience tabular data like contact lists. 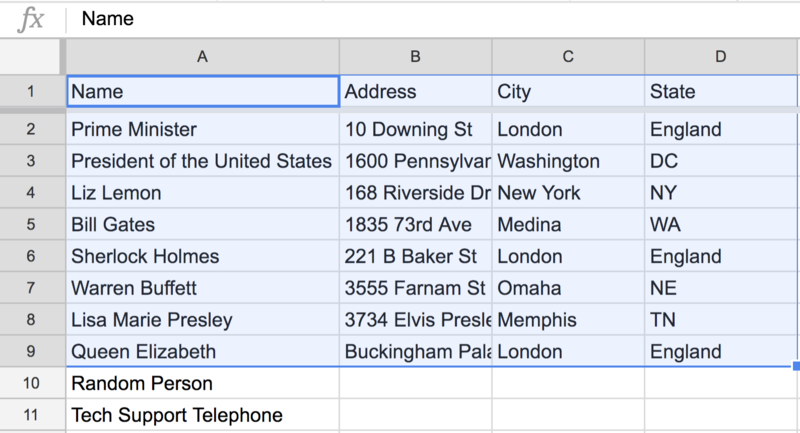 Whether you want a backup of your contacts or are looking to import addresses into google maps, follow the instructions in this post to get your contacts into Excel format. The first thing you want to do is login to Google Contacts and view you’re contacts. If you have multiple Google accounts, you’ll need to either make sure you login to the correct account, or use multiple accounts and select the account chooser in the upper right hand corner. You’ll know you’re in the right account when you have a list of contacts that look familiar. If your list looks like the version on the left, you’re using the older Google Contacts. That’s ok, you’ll still be able to export to Excel. The one on the right is the newer version. Our example list contains just a few people. You likely have many more! While you may recognize the names in our list, you probably don’t have famous people in your list. But hopefully you do recognize many of the people in your list, since they’re your contacts! Google Contacts lets you organize contacts into multiple lists. In the older version of Google Contacts, these are called Groups. The newer version calls them Labels. In either case, it’s a way of maintaining lists of contacts. You may keep your contacts all in one list, or have ways of organizing them. If you’ve imported contacts in the past, they were added to a list for that import. Contacts can be a member of more than one list. Now that you’ve logged into Google Contacts and found out which lists you want to transfer to Excel, let’s download the list as a Comma Separated Value (CSV) file. It’s important to note that Google Contacts does not directly support Excel format (XLS and XLSX). However, a CSV can easily be opened by Excel and most other spreadsheet software (such as Google Sheets, Excel Online, and Numbers for Mac). To export your Google Contacts, find the menu in the left sidebar (along the top if you’re using the old version) and select “More.” You’ll now see additional options available, including “Export.” When you click that option, a modal window will appear above your contacts list with a few options. You can choose a specific contact list or choose all contacts. The other option is the file format. As mentioned, you won’t see one directly for Excel. The pre-selected Google CSV is the format you should use if you want to convert to Excel. If you need your export to be opened by Outlook, choose that option. If you want to use Apple’s Contacts app (including on iPhone for iPad), you’ll want the vCard option. Most likely, you want to move your contacts into Excel or another spreadsheet. In that case, leave Google CSV selected and click “Export.” Your web browser should initiate a download (or ask you permission) shortly. If you have a lot of contacts, it may take a few seconds more to start the download. Once the download is complete, you can find the file wherever your browser typically stores downloads. Common locations are a “Downloads” folder or directly on your computer desktop. The file will be named google.csv so if you can’t browse to your downloads folder, you could try searching for the file. Once you find the file, in some cases, you may be able to double-click to open. The best approach is to open it directly from Excel. Open up your Excel application and choose the option to open an existing file. If Excel opens with a blank document, you can navigate to the “File" menu and select “Open.” Now find the folder where google.csv was downloaded, then double click on the filename. Depending on your version of Excel, the file may open directly. In other cases, you’ll need to step through to confirm Excel’s conversion from the CSV. It will note the headers it found and show example data. The Google Contacts CSV is well formatted, so conversion should be automatic. Once your spreadsheet is open, you can save it as an Excel document, just as you would any other spreadsheet. You can also edit, sort, filter, and perform any other spreadsheet functions. Now that you have a spreadsheet full of contacts, you can try plotting them on a map. It can be enlightening to see your contacts mapped. For example, many sales teams will map their customers, leads, or assets. In order to place each contact geographically, they’ll each need to have an address. Since Google Contacts is used by its Gmail application, you may have contacts for which you have an email address, but not a street address. We’ll need to remove them from your Excel document—or at least ignore them when we create our map. There are a couple ways to show only the contacts who have a street address. The simplest, which works across various spreadsheet tools, is to sort the address column. Then copy and paste that over to our spreadsheet mapping tool, follow the steps and you’ll have a map of all your contacts. Whenever you need a map from location data, whether it’s Google Contacts or perhaps an export from your CRM, check out BatchGeo.